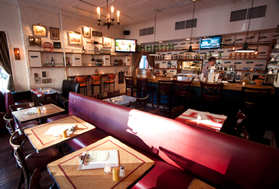 Ox Cart Tavern is a great way to experience local and authentic food in Brooklyn, New York. It is located in a quit neighborhood and is almost always unseen by tourists. Ox Cart Tavern is a small restaurant and also has a bar. They offer a wide array of food and drinks, as well as a special's menu. They have something for every consumer, including vegan and vegetarian food choices.